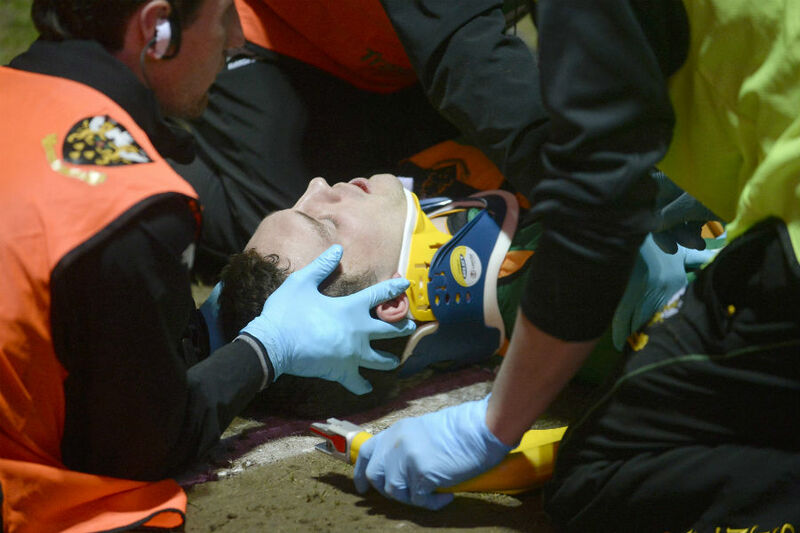 Northampton Saints have played down injury fears for George North after he was carried off the pitch on a stretcher following a blow to the head, with director of rugby Jim Mallinder saying after the 52-30 Aviva Premiership victory over Wasps: "He is okay now; he is up and walking about in the dressing room." North played on for Wales against England after he was twice hit in the head during the Six Nations-opening Test in Cardiff in February, but he subsequently missed the Dragons' victory over Scotland at Murrayfield due to lingering effects of concussion. 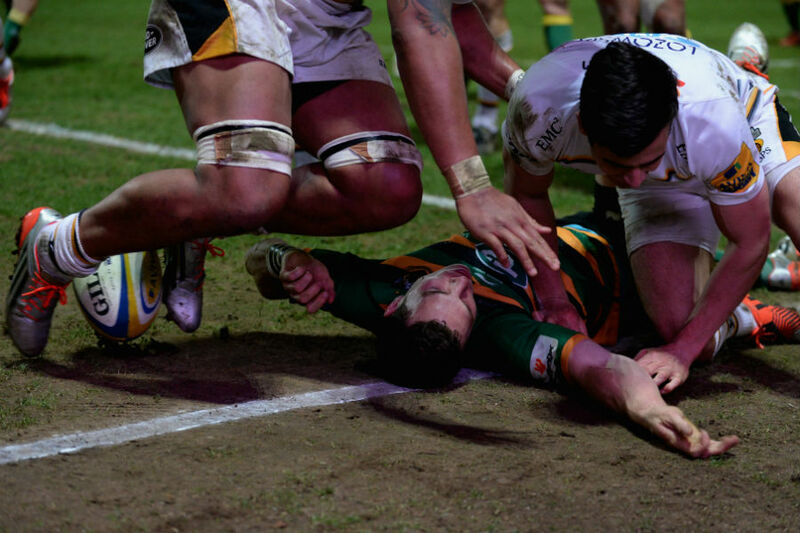 And there were worrying scenes when he took a knee to the head from Nathan Hughes at Franklin's Gardens on Friday, when the Saints, Wales and British & Irish Lions winger lay motionless on the ground for a few anxious moments before he started moving shortly as medics attended to him. "It is a knock to his head, which is not good," Mallinder said. "We will look after him and make sure he comes back when he is right." Hughes was sent off for kneeing North in the head in the 35th minute as the Northampton man scored his second try, but the Wasps No.8 protested his innocence. Wasps director of rugby Dai Young labelled the sending off "harsh" but Mallinder said the challenge was "reckless" and called for action. "It was a tremendous kick-off by Stephen Myler and a tremendous take by Samu Manoa. George North still had quite a lot to do and scored a good try in the corner. The opposition have got to then be very careful once the try is scored, and it was reckless coming in with the knee. Some serious consequences happened because of it." Wasps were leading 20-8 through two tries from Christian Wade, who went on to complete his hat-trick, when the incident occurred. With Hughes off the field, however, Saints scored two tries in five minutes through a penalty try and Alex Corbisiero. The hosts then added three more tries in the final eight minutes of the game with two from Ahsee Tuala and one from Ken Pisi. Young said: "First of all I hope George is OK. Nathan has gone looking for him to make sure he is okay; he is not that type of person. "When you slow anything down it looks worse than it actually is and when the crowd get on the referee's back - a young referee - there is only going to be one decision. We felt it was a bit harsh. "That eight minutes before half-time killed us, and the last eight minutes made the scoreline look a lot worse. It was a little bit cruel we didn't come away with a bonus point. "The officials work as a team, you have to have help from your touch judges. I am not saying for a minute we lost the game because of the referee, as Northampton played a lot of good stuff, I am just surprised a few things were given."